Some very contemporary tiffin boxes have just been delivered to Galerie CO. We’re happy to have them in time for the good weather; think picnics! For those who don’t know, a traditional tiffin is a tin container consisting of a number of bowls, each containing a separate dish, held together in a frame, made famous by the amazing tiffin men (tiffinwallahs or dabbawalas) who deliver them in Mumbai, India. Mumbai, the business capital of India, is one of the largest, most sophisticated cities in the world. Ironically, in the midst of the progress and modernization the business people of Mumbai continue to cherish and respect a thoroughly traditional and low-tech service provided by the city’s tiffin men who deliver their lunchtime meal to them from home. Every day around 5,000 tiffin men deliver up to 200,000 home-cooked lunches (tiffins) from suburban communities directly to commuters in the offices of Mumbai. This extraordinary service started in 1890 when there were few restaurants around the city and people tended to be suspicious of food offered outside the home. But it has continued despite the explosion of restaurants onto the food scene in Mumbai. Each morning the tiffin men stop by the homes of their clients (who have already commuted into Mumbai) to pick up their lunch boxes, or tiffins. The tiffins will typically be filled with a home-made lunch of rice, dal, vegetables, and roti packed into the separate sections. They are frequently packed into insulated bags and taken by train from the suburbs to a central station in Mumbai where they are organized according to street address and floor. The 100-kilogram crates of tiffins are then dispatched for delivery at lunchtime on tiffin men’s heads, hand-pulled wagons or bicycles. After lunch the process is reversed and the tiffins are collected and delivered back to suburban homes before the commuter returns home from work. The exercise involves a fine balance between chaos and precision, evident in this video portraying a day in the life of a Mumbai tiffinwallah. There are no computers behind the tiffin-delivery system. There is no paper trail. In fact, most tiffin men are illiterate. On every tiffin there are simply four codes indicating where the tiffin came from, where it needs to go, and railway stations for delivery and pick up. The sturdy tiffins are re-used day in and day out, eliminating the waste associated with take-out and delivery food. Despite the low-tech system, the accuracy with which the tiffin men deliver their lunches is astonishing. Theirs is one of the most efficient supply chains in the world; they only make one mistake in every 8 million deliveries. One such error inspired a film entitled, in hindi, “Dabba” (translated as “The Lunchbox”), which tells the story of the people affected by the mistaken delivery of a tiffin. You can still catch the film (Indian with English subtitles) in several Canadian cities including Montreal, Toronto and Vancouver. The service provided by the tiffin men is highly valued and they command enormous respect. In the midst of change in a rapidly developing part of the world some values hold true; in this case the traditional preference of the people of Mumbai for a home-cooked meal. What would you put in your tiffin box? Let us know in the comments below, on Facebook or on Twitter. We love to hear from you! Today is Earth Day and in Canada, in 2014, the theme is sustainable cities. There are several ways that cities can work towards sustainability. These include: investing in adequate green space, responsible community design, “green” buildings and energy efficiency, public transportation, cycling infrastructure, reliable waste and water treatment, effective recycling programs and ensuring access to healthy food. We’re interested in all of these issues, but right now it’s Spring and access to healthy food is front and centre. Local asparagus will soon be available, followed by strawberries and more, signalling the start of the early harvest. We can, if we wish, become “locavores” for a few precious months in the Northern hemisphere when we can choose to eat locally grown food that’s in season. For much of the rest of the year, despite the fact that we have unparalleled access to an abundance of exotic foods, we’re geographically disconnected from our food supply. This means that much of our produce travels hundreds, if not thousands, of miles from the farm to our tables. 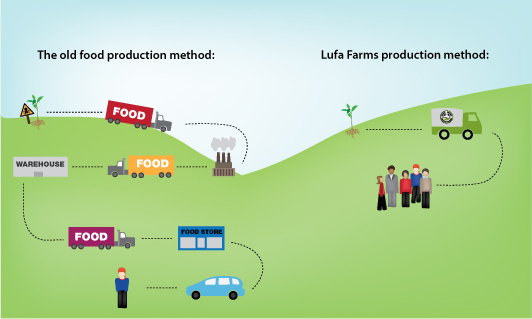 Montreal’s Lufa Farms is working to reverse this. It’s a farm located on the roof of a building in an industrial park, which provides access to fresh vegetables all year round through innovative agricultural production in the heart of the city. 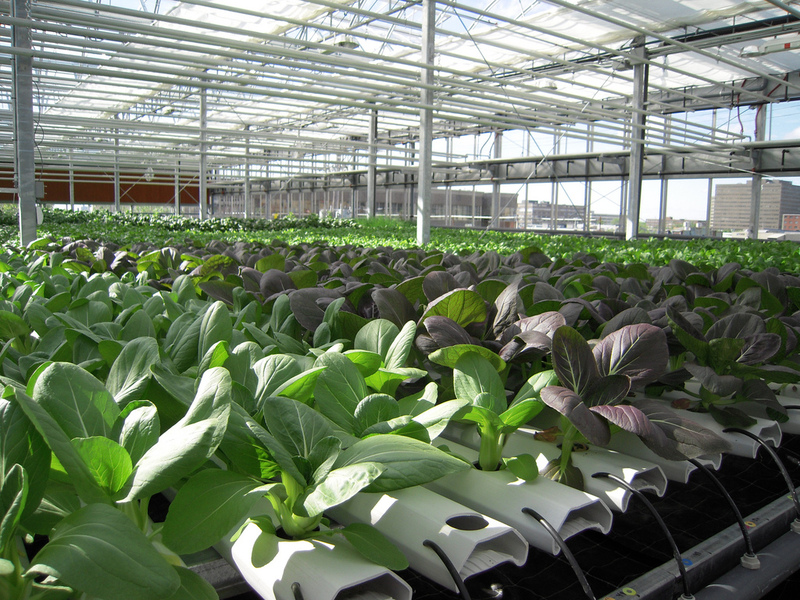 Started in 2011, Lufa Farms was the first urban rooftop commercial agricultural production in the world. By 2012, it was feeding 2,000 people, using half the energy, water and nutrients of traditional agriculture. And that was just the beginning. We want to share its story to mark Earth Day and celebrate Lufa Farms’ contribution to making Montreal a more sustainable city. This meeting of the old and the new is reflected in the hydroponic production process employed at Lufa Farms, which relies on a finely tuned balance between ancient techniques and state-of-the-art technology. For example, the greenhouses are pesticide- and fungicide-free relying on a pest management system that utilizes other insects; bees are used to pollinate and ladybugs to control the aphid and white fly populations. And no chemical fertilizers are used; green waste is composted to feed the plants. Yet, in conjunction with these low-tech approaches high-tech technologies are employed. 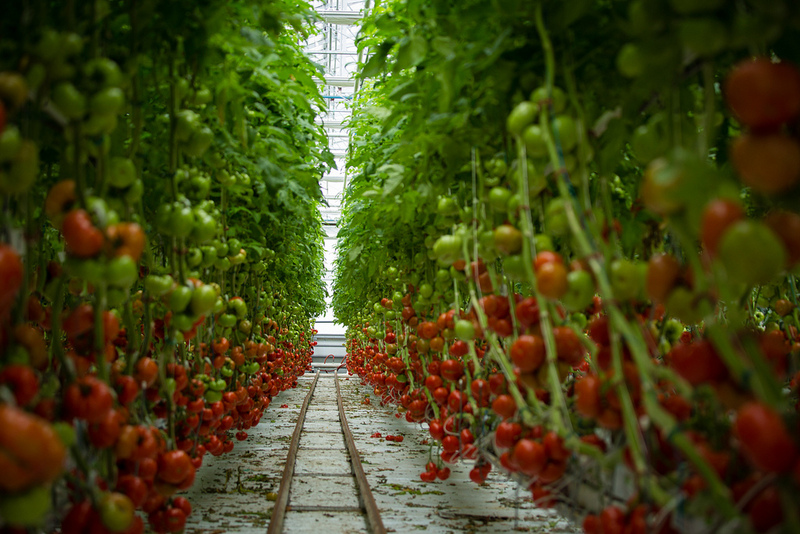 Lufa Farms relies on solar energy and cutting-edge micro-climate management software, which captures energy efficiencies and carefully controls temperature and humidity levels throughout the greenhouse encouraging maximum yields for each crop. And a sophisticated closed-loop water system harvests rainwater and re-circulates the run-off from the plants. Lufa Farms operates on a subscription basis, which is a great way for farmers to reduce crop waste because only the product that has been ordered is harvested. Customers sign up for a weekly box of food that can be customized up until midnight the night before the harvesting, picking and packing. The food is then delivered to one of several pickup points across the city, where it is collected by the customer. Hydroponic production is not eligible for organic certification in Canada, which is ironic in this case, considering the many economic, environmental and social benefits of this model of urban farming. Healthy food. 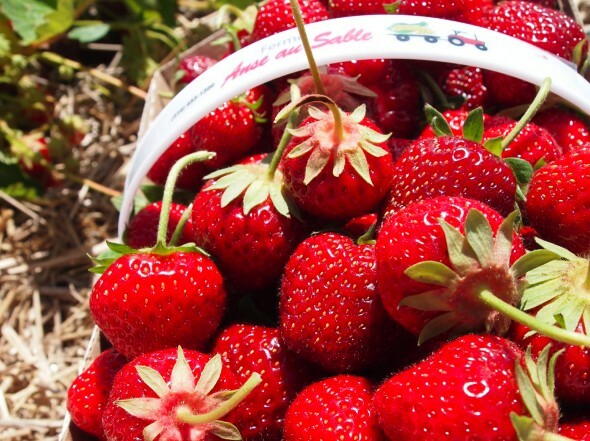 The produce is safe, uncontaminated by residues from chemical pesticides and fertilizers. In fact, some local produce (broccoli, green beans, kale, red peppers and tomatoes) may even have a higher nutrient value when it’s given more time to ripen, due to the shorter time between harvest and consumption. 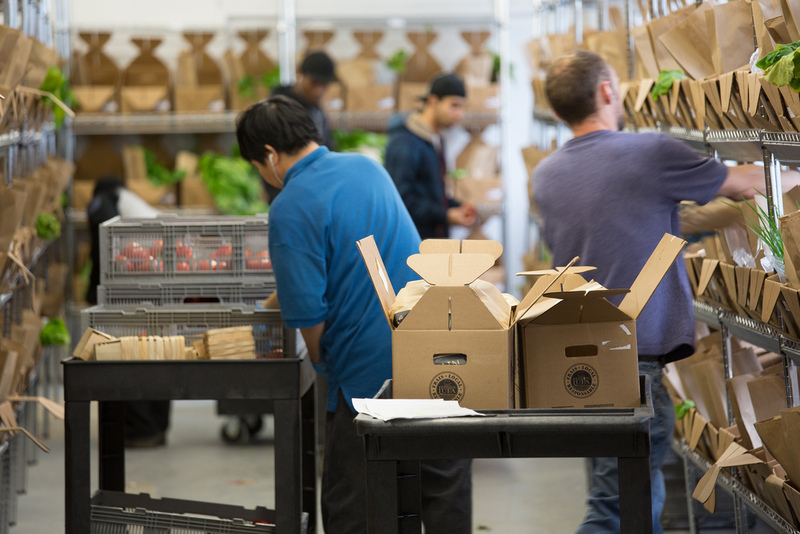 The produce is picked at their peak of ripeness and is in the hands of customers within 24 hours. The short turnover means it will tend to taste better, encouraging us all to eat more veggies! 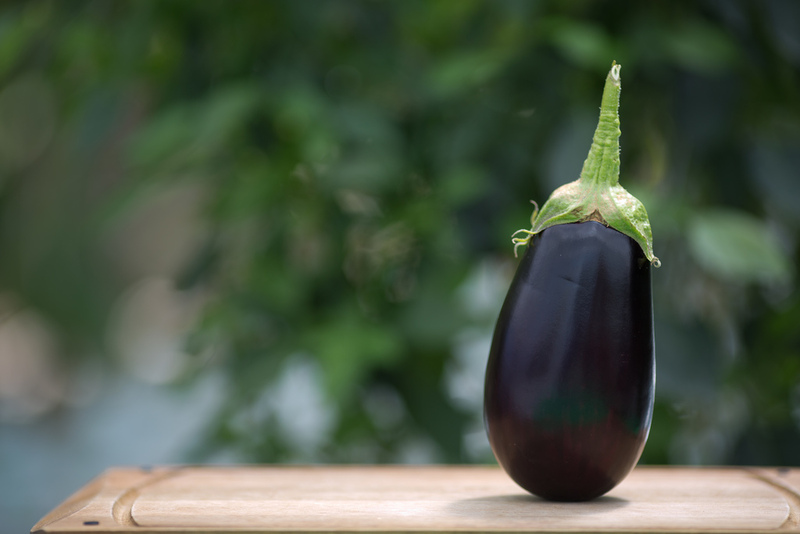 In fact, when farming locally, farmers can choose to plant cultivars for taste, rather than for transportability, so that the most flavourful varieties (rather than the hardiest varieties) are grown. Environmental benefits. The environmental benefits from a hugely reduced carbon footprint as a result of drastic reductions in transportation, and energy efficiency in the greenhouse, are significant in lowering greenhouse gas emissions. Moreover, the plants themselves remove carbon dioxide from the air, doing their bit in the battle against climate change. Efficiencies in water use and capturing run-off conserve and protect water resources, and promoting the cultivation of non-hybrid heirloom varieties helps protect the planet’s genetic diversity for future generations. Food security. In a time of urbanization this type of local urban agriculture contributes to feeding increasing numbers of city dwellers and to ensuring a secure and sustainable food supply. Strengthening communities. Drop-off points in communities encourage exchanges of ideas, recipes, and even produce. And when the people who produce your food, live and work in your community, you, your children and your neighbours know a lot more about that food. Supporting the local economy. Money that is spent with local farmers stays close to home and is typically used to provide employment to local people and is reinvested in businesses and services in the community. All of this helps explain why projects like Lufa Farms are so important in an effort to build sustainable cities. Lufa Farms has formed partnerships with other local food companies with similar values and offers an online marketplace where customers can shop for most of their groceries. 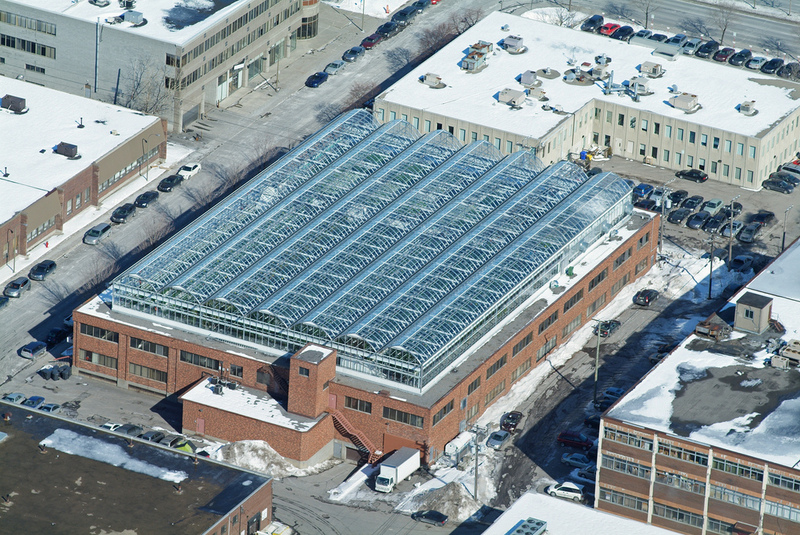 This model has been such a big hit with Montrealers that a second greenhouse has been built to keep up with local demand and further expansion is in the pipeline. Do you have an experience with urban agriculture? How are you recognizing Earth Day? We’d love to hear from you. You can comment below, tweet us @GalerieCO or leave us a message on our Facebook page. Easter is right around the corner. But there’s still time to have some fun in the lead up to next week’s holiday. This weekend, why not try your hand at dyeing some eggs using natural ingredients that you can find around your house? Civilizations have used natural dyes dating back to the Neolithic period. The majority are made from common, locally available organic materials. They are vegetable dyes from plant sources such as roots, berries, leaves and wood, which produce pure shades that mellow with age but preserve their true colours. However, the discovery of man-made synthetic dyes in the mid-19th century triggered a decline in the market for natural dyes. The new chemical dyes could be produced in large quantities and introduced vibrant colours such as bright purple, magenta and fuishia. They quickly superseded natural dyes for the commercial textile production enabled by the industrial revolution. Unlike natural dyes, however, chemical dyes tend to fade with age rather than mellow naturally. Fast forward to the present day; the market for natural dyes is experiencing resurgence with consumers becoming more concerned about the health effects and environmental impacts of chemical dyes.